It is famous for its street food. 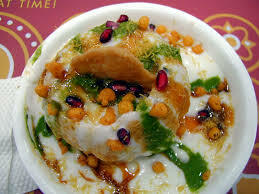 The variety consists of snacks, especially chaat. This colorful chaat or snack is quite popular in Delhi and other parts of northern India. It consists of kachori small fried bready balls and a variety of other yummy things chickpeas potatoes tomatoes moong sprouts masalas yogurt coriander and tamarind chutneys pomegranate seeds crunchy sev stuffed inside and atop a thin and very crispyfried purilike hollow shell. The various chutneys and yogurt coat the whole affair making it a perfect mix of wet and crunchy sweet and tangy spicy and cooling. In other words: an ideal funtoeat chaat.